No special bonuses, no free spins, but still something I want to point out. 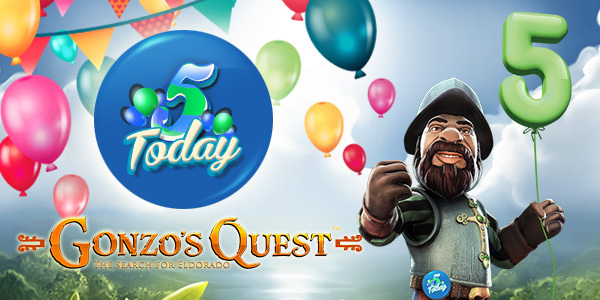 Gonzo’s Quest has turned 5 yesterday! I almost forgot, forgive me Gonzo. One of the most famous and recognizable slots online, created by NetEnt, is now 5 years old. This slot was released back in 2010 and was an instant hit. The unique gameplay was something completely new back than. And Gonzo’s Quest is still one of the most popular NetEnt slots today. I am sure that several NetEnt casinos will be running some kind of special promotion or free spins bonus to celebrate this event. But there aren’t any big promotions mentionable. So just visit your favorite casinos and see what they offer. Never played Gonzo’s Quest before? It is really worth a try. With falling symbols, increasing multipliers and a free falls bonus. So again, congrats Gonzo! Here’s to another 5 years.